During the recent heavy snow and rain storms that hit NYC, the Union Square Clean Team did an outstanding job keeping the district clean, safe, and dry. 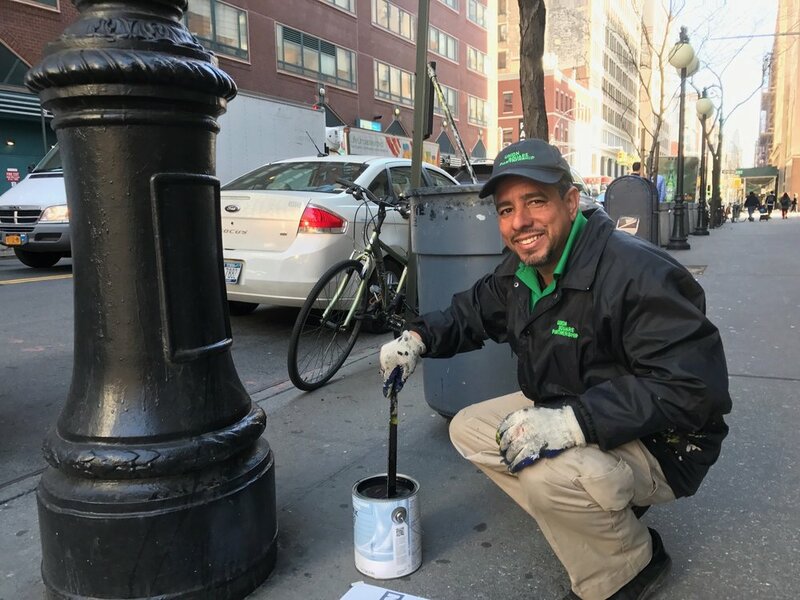 From braving the rain and clearing catch basins to shoveling snow and salting sidewalks, our team puts in the effort to keep Union Square vibrant and beautiful. We’re grateful for their hard work not only during these cold winter months, but we’re also thankful for their year-round efforts to make the neighborhood shine. 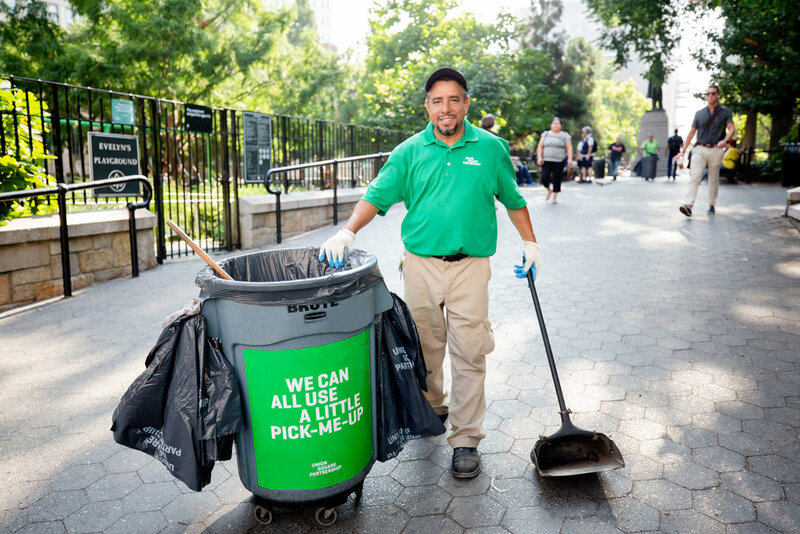 Beautification and sanitation are at the core of our organization’s work, and we rely on the Union Square Clean Team (contracted through StreetPlus) + our Operations Managers to keep Union Square clean, safe and beautiful 365 days a year. With over 344,000 people walking through our neighborhood each day, our team is constantly on the move to keep Union Square a wonderful place to visit, work and live. Our success around the district is made possible by our team leaders working in the field on projects benefiting the neighborhood. Supervisor Mamdou Ndiaye has been managing our Clean Team on the ground for over two decades. In addition to his work with the Clean Team, Operations Manager McLawrence Glynn works to address a wide range of quality-of-life issues within the district. Finally, Director of Operations Tom DiRusso oversees the entire program, while also working with our local law enforcement partners on neighborhood safety initiatives. We all love NYC in the snow, until that Winter Wonderland turns into a slushy, icy mess. 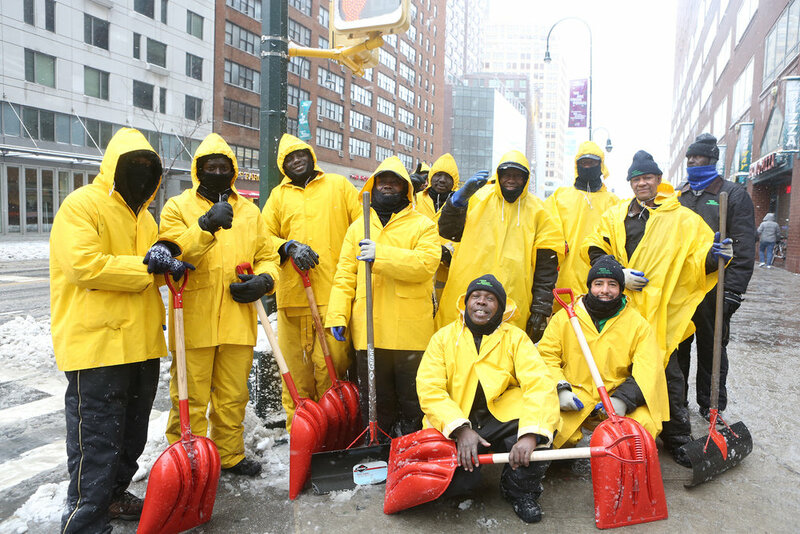 When a storm hits, our Clean Team suits up to ensure the streets of Union Square remain clear and safe. In the cold of a blizzard, you'll find the team working hard to clear sidewalks, intersections and catch basins so pedestrians can travel safely and avoid large icy puddles and slippery streets. NYC has seen a number of heavy snow and rain storms recently, and our team did a great job handling the inclement weather. We know they’ll keep it up as we move through the colder season and continue their great work year-round. Each day you'll see our team in their signature green polos sweeping trash off the streets, or emptying one of our USP-purchased dynasty cans, as well as our Big Belly solar-powered trash compactors. Through these efforts they remove more than 178,000 bags of trash from the street each year. If you're in the neighborhood prior to their start at 7 AM, you can see firsthand the impact they have on your clean morning commute. Your favorite spots to enjoy lunch or meet a friend in the park are maintained by our Clean Team seven days a week from April to October. Each of our five seasonal seating areas, stocked with signature green bistro tables and chairs and teal USP umbrellas, are set up, stored, cleaned and maintained by the team. These areas see constant usage, and we’re thankful to our Operations Team for making it easy to enjoy a relaxing moment in the park. This year, we even added a brand new seating area on the west side of the park - if you haven’t already, check it out when the bistro furniture returns this April! Our team works seven days a week to remove graffiti from public property, and stickers from light poles, railings and benches. Additionally, each fall and spring, the Clean Team surveys the district to repaint public amenities like tree guards, benches, mailboxes, sidewalk elements and more, keeping the neighborhood looking fresh for each new season. With over 344,000 people walking through our neighborhood each day, Union Square sees a lot of wear and tear. Each week during the warmer months, the Clean Team power washes high-traffic corners and Union Square Park plazas to remove built-up grime and dirt from the busy streets. We’re thankful for our hard-working Union Square Operations Team year-round, and we’re especially grateful for their hard work during the winter months. This giving season, consider donating to support our beautification efforts, and help make Union Square bloom! Donate here.